The CTA Challenge Ladder program has been supported and led by the Charlotte Tennis Association since its inception in 2005 when it was founded to meet the needs of players in the greater Charlotte community. The CTA Challenge Ladder program has been in continuous operation offering four 11 week seasons per year of singles/doubles/mixed doubles play across all levels. It's a great way to connect with players at your level and play at your own convenience. The CTA Challenge Ladder is an activity generator, and points are awarded for matches played. The CTA Challenge Ladder ranks players weekly using computer points similiar how pros are ranked. Players/teams set their own matches at their convenience and play as often as they want, wherever they want. The more you play, the more points you receive to improve your ranking (even if you lose). Each season culminates with a playoff event for the top finishers on the Ladders. We offer all levels of play for Men's and Women's Singles and Doubles as well as Mixed Doubles. 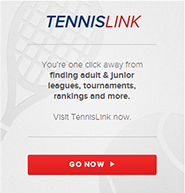 If you do not have a USTA rating, click here for assistance in determining your level of play. You can play on a 2-player doubles team or a 3-player doubles team. You can participate in up to two singles, two doubles, and two mixed doubles ladders at your NTRP level and one level above. How to Register: Begin the process by clicking on Player Registration on the menu bar to the left. Complete the Registration Form and click 'Submit'. You will then be automatically forwarded to PayPal to complete the payment process. You will have the option to pay through your PayPal account or by using a credit card. You will immediately receive an email notification confirming your payment. If you are new to the CTA Challenge Ladder you will need to create a user profile once your payment is processed. Click on Ladder Access/Login for instructions on setting up a user profile. The CTA Challenge Ladder Coordinator will confirm your participation when you have completed the registration and the user profile process. Ladder Rules, Features & Functionality and FAQs: Not sure of the rules? Need help navigating the system? This link provides all the details on how to have a fun, enjoyable ladder experience.